Echovate, a people analytics company that works with companies and higher education institutions, released a white paper today titled, “An In-Depth Look Into the Emotional & Social Intelligence of Generation Z: The Echovate College Student Data Study.” The white paper includes data from Echovate’s original research during a nationwide survey that included more than 1,100 currently enrolled colleges students from over 750 institutions. “Generation Z is being heavily researched by many prestigious groups across the country. There’s data around how they’ll spend their money and who they are likely to vote for, but we wanted to specifically look at the emotional and social intelligence of today’s college student. Who really are these students? How is the world shaping the personalities of this next generation?” explained Matthew Gough, Founder & CEO of Echovate. “The results of our study support much of the research and theories that are already out there regarding Gen Z, but it really allowed us to see this population through a new lens. They’re determined, compassionate, and really responsible for their age. It will be interesting to see how their personalities shape the world as they graduate and enter the full-time workforce,” added Gough. 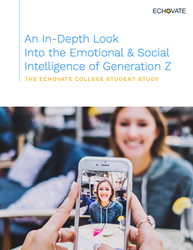 For more information about the research study, download the complete white paper, “An In-Depth Look Into the Emotional & Social Intelligence of Generation Z: The Echovate College Student Data Study” by visiting echovate.com/gen-z. About Echovate: Echovate is a people analytics company. Our software empowers organizations to capture and visualize emotional and social intelligence data to build predictive success models and improve future outcomes. To learn more about our work with companies or higher education institutions, visit echovate.com.